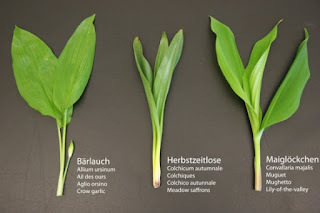 In 2004, in the canton of Neufchâtel, Switzerland, clients from a restaurant who ordered fish with a bear's garlic sauce, Allium ursinum (Figure 1), went on a painful adventure. Shortly after eating they started to have severe gastrointestinal troubles. After analysis, it was found that the sauce contained colchicine, a toxic alkaloid. This compound is produced by the meadow saffron, Colchicum autumnale (Figure 2), a plant that looks pretty much like bear's garlic and often grows in the same environment. Furthermore, to be edilble, bear's garlic needs to be harvested in the early spring when the first leaves appear and before bolting. As we already saw in the last post, the use of only the leaves for botanical identification can sometimes be tricky. In this particular case the best way to be sure of the identity of the garlic and the saffron, and to a lesser extent the lily-of-the-valley, Convallaria majalis (seen on Figure 3), is to use our nose. Garlic smells like garlic, the others ones don't smell anything. Unfortunately, the smell has a tendency to stick to the finger and interfere with the identification, even more so when we harvest a big batch. This leads to an easy mix-up. This situation is not necessarily common, but can be fatal. This situation is a good representation of the hazards that can cause a misidentification. As I already have demonstrated, many plants can look the same and be confused with one another. 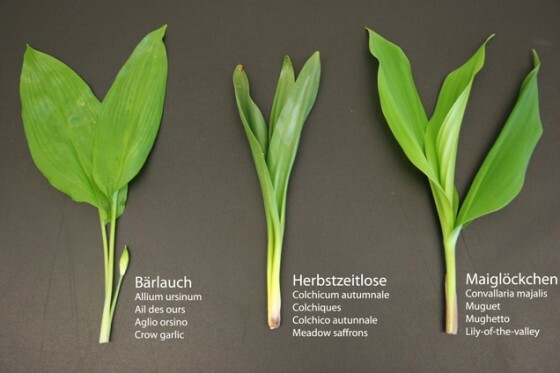 In North America there is also a wild garlic, ramp, Allium tricoccum (Figure 4), that can also be confused with other plants in their juvenile form: Clintonia borealis (edible, young leaves only), Convallaria majalis (toxic), Cypripedium acaule (dubious edibility) and many more. Another interesting case, albeit less common, is the Cow Parsnip, Heracleum maximum (Figure 5). America's First Nations ate the stems of this plant like a legume, and today it is still considered edible (its consumption is marginal though). This is an interesting case due to its great ressemblance to its cousin: the Giant Hogweed, Heracleum mantegazzianum (Figure 6). The later has the disagreable properties of causing serious burns when we enter in contact with any part of the plant. If you enter in contact with the plant, hide the affected part from the sun or any strong light during at least 1 to 2 months. By experience, even with this precaution, it is possible that the affected skin turn a bit darker, but, at least, it won't cause blisters. A misidentification can therefore have serious consequences. It is important to note that Cow Parsnip can have the same effect on sensitive people, but the latter is generally considered safe if peeled. Sensitive people can also have the same problems when touching limes or other plants: it is called phytophotodermatitis. Finally, here is a very special case. To keep with the tradition of the last post, I will ask you to check the two following pictures and to keep an eye out for what could differentiate those two plants. 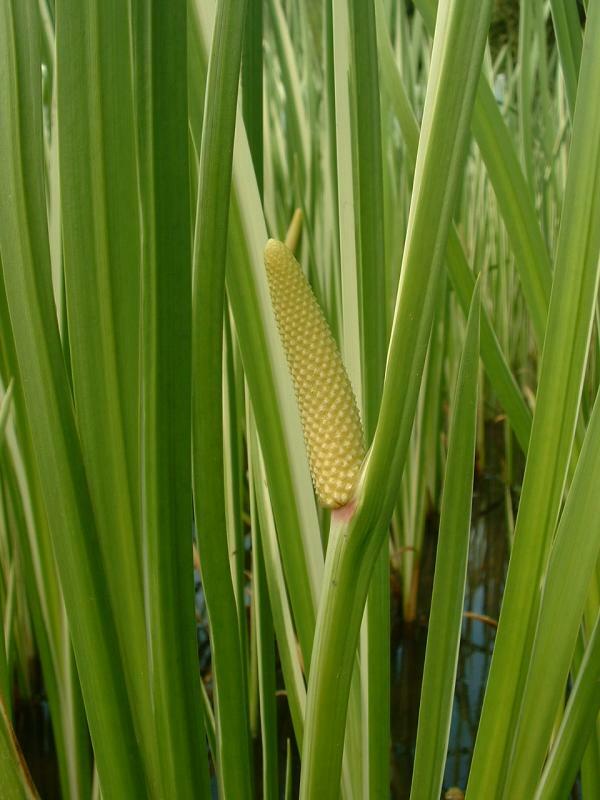 It is two varieties of the same plant, Acorus calamus (A, source) and Acorus calamus var. americanus (B, source). The difference between these two plants are the number of chromosomes, and their concentration in β-asarone, a carcinogenic compound that also cause vomiting. The American variety is diploid (2n) and contains no or almost no β-asarone. The European and Asian version are tri- or tetraploid (3n and 4n) and contain a lot of β-asarone. I will give you more information on these kind of chemical and environmental variation in a later post. There is still a lot of plant that can be confused, which we will see later. In the next post, we will explore the toxicity of edible plants (!). Edit: My thanks to /u/Thallassa on reddit for the revision and input.